Also known as "Fomes ohiensis," this polypore has a distinctive pore surface--which is good news for me, because I usually find it in "resupinate" forms (to use the mycological term that indicates a pathetic, spreading pore surface that can't even muster up a cap). 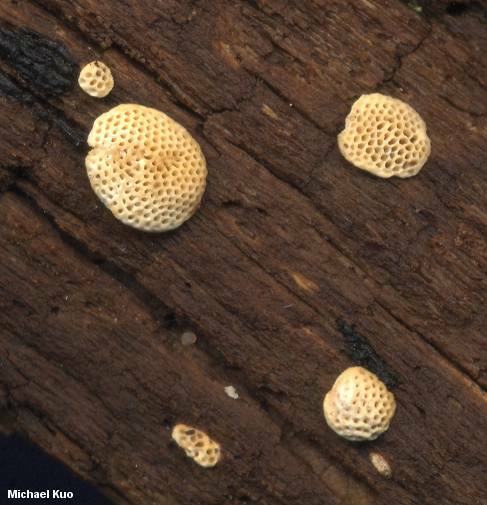 The pore surface of Perenniporia ohiensis is ivory white, and the round-ish pores are surrounded by very thick walls ("thick" in a proportional sense, since there are 3-7 pores per mm). When a cap is present--which is evidently more often than not, despite my experience--it is hoof-shaped and whitish, becoming brownish and eventually black with age. Ecology: Saprobic on the deadwood of hardwoods; common on fence posts and rails (especially those of locust wood); causing a white rot; resupinate or, more commonly, with a cap; perennial; found year-round (especially in warmer climates) but generally appearing in summer and fall; fairly widely distributed in North America from the East Coast to the Rocky Mountains and the Southwest, but apparently absent or rare on the West Coast and in the Pacific Northwest. Fruiting Body: Sometimes lacking a cap but usually with a tough, hoof-shaped cap measuring up to 2 cm across; upper surface smooth or finely velvety, whitish at first, becoming brownish and eventually black, often with a zoned appearance; pore surface ivory white, the pores surrounded by thick walls; 3-7 pores per mm; tubes to 4 mm deep per layer; flesh woody and tough, whitish to brownish; stem absent. Chemical Reactions: Cap surface red to blackish with KOH. 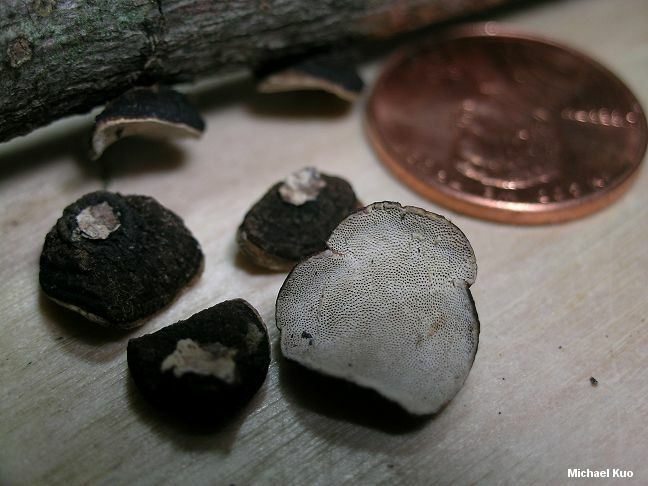 Spore Print: Presumably white, but not documented (I have not tried to obtain one). 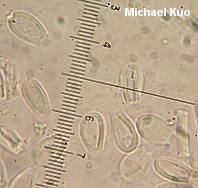 Microscopic Features: Spores 13-16 x 7-10 µ (but my collections frequently feature smaller spores, measuring 8-11 x 5-6 µ); smooth; elliptical, with a severely truncated end; hyaline in KOH; in Melzer's sometimes faintly or strongly dextrinoid; thick-walled. Cystidia absent. Hyphal system di- to trimitic. REFERENCES: (Berkeley, 1872) Ryvarden, 1972. (Overholts, 1953; Gilbertson & Ryvarden, 1987; Binion et al., 2008.) Herb. Kuo 08150502, 04300701, 11040901.